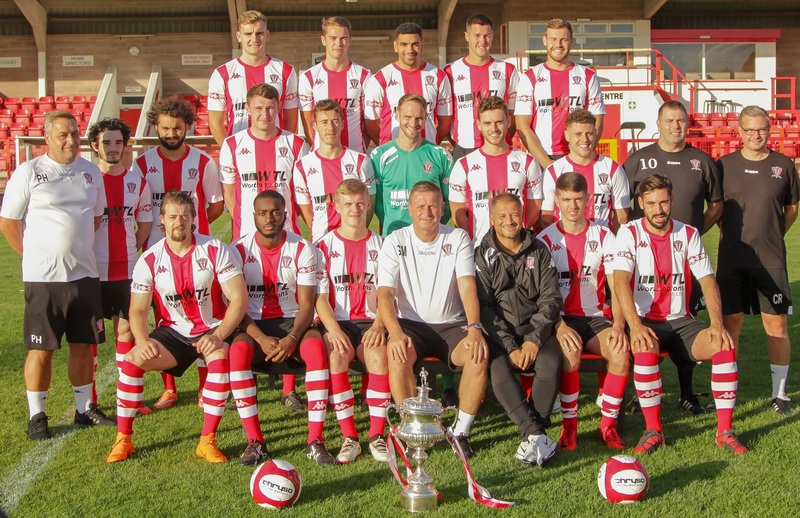 Witton Albion were knocked out of the Integro Sport League Cup after an injury time strike by Kidsgrove Athletic striker Jacob Twyford helped his side complete a comeback victory at Wincham Park. Twyford's winner came two minutes into second half stoppage time when a penalty shoot-out was looking the most likely outcome of a game which offered little in terms of goalmouth action. Carl Macauley made a whole host of changes from the side which beat Whitby Town in the FA Trophy at the weekend, with notable inclusions for Under-21 goalkeeper Jake Eastwood making his first team debut and striker Gareth Arnison making his home debut for the club after joining a couple of weeks ago. After an impeccably observed minute's silence by the 127 in attendance as a mark of respect to the victims of the helicopter crash at Leicester City last weekend, it was a quiet start to the game with neither side really threatening a noteworthy effort on goal in the first 20 minutes or so. In fact, the first real chance opened the scoring as Albion scored on 21 minutes. A left wing corner by James Foley was flicked on by Arnison. The ball ricocheted off the Kidsgrove goalkeeper and the near post and landed at the feet of Cesaire Lingouba who had the simple task of sticking it into an empty net from close range, his first goal for the club. Will Booth had a chance to double the Witton advantage a few minutes later, but his free kick from 25 yards was fired too close to the goalkeeper who made an elementary save. Kidsgrove got themselves back on level terms on the half-hour mark, and the goal came from the penalty spot. Will Saxon did incredibly well down the left, his pace causing problems before he was brought down inside the box by James Yates. The referee had no hesitation in pointing to the spot and Jacob Twyford struck down the middle and into the net for 1-1. Rumenio Vaudo-Barai dragged a shot wide when in a good position for the visitors before Foley had a powerful strike blocked by a defender before the interval. Vaudo-Barai fired over the bar before winning his side another penalty just before the hour mark. He was brought down when trying to wriggle his way past River Humphreys. He brushed himself off and took the penalty himself, a poor one in fairness although young shot-stopper Eastwood was on hand to make the save. There was a triple change for Albion soon after as Arnison, Shane Williams and Humphreys were withdrawn, Will Jones, Tom Owens thankfully recovered after his seven week arm injury lay-off, and Josh Wardle taking their places. Jones' first touch was almost a goal, as he got on the end of an Anthony Gardner cross from the left but could only steer his header wide of the target from 12 yards. At the other end, Anthony Malbon hit a low shot on the turn which Eastwood saved before the all-important goal right at the end. Following good work down the left, the ball was cut back and Twyford produced a very smart finish from 15 yards to beat Eastwood and send Kidsgrove into the hat for the next round, just when a penalty shoot-out was looming large. Along the way registering Grove’s first victory over Albion at the 11th attempt. Albion are back in action at Wincham Park on Saturday afternoon where we entertain Lancaster City in the league, 3:00pm kick-off.